Although it is more stable today, Georgia is still a very transient society. Most people relocate about twelve times during their adult lifetimes. Some people move to be closer to work, and some move for financial reasons. Other people move to be closer (or further away from) family. Typically, money is tight at these times. So, many families try to save money with a U-Haul or other rented moving truck. These large vehicles are difficult to drive. In many cases, a vehicle of that size might require a commercial drivers’ license. Additionally, most of the drivers are in unfamiliar territory. As such, they may have one eye on the road and one eye on a GPS navigation device. 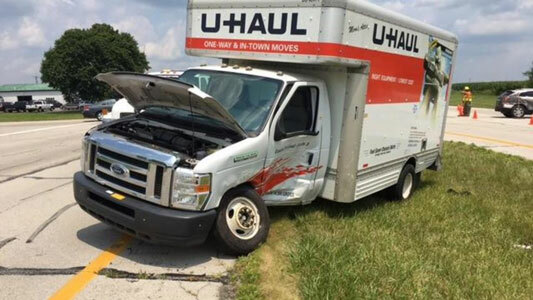 So, during the spring and summer moving season, U-Haul wrecks are quite common. These vehicle collisions often cause serious injuries, and as a result, substantial compensation may be available. But commercial negligent entrustment cases have an unusual wrinkle due to an obscure federal law you have probably never heard of. Direct Evidence: Generally, people with no drivers’ licenses or safety-suspended licenses are incompetent as a matter of law. It does not matter how much experience they have behind the wheel. The same result may apply if the tortfeasor violates a drivers’ license restriction, such as driving without eyeglasses or at night. Circumstantial Evidence: Some drivers have several at-fault accidents or tickets on their driving record. Even if Georgia has not suspended the person’s license, that driver could still be incompetent. The same thing may apply if the tortfeasor has caused a number of “near-miss” accidents. Private negligent entrustment claims also arise any other time an owner loans a vehicle to an incompetent driver. That could be a roommate loaning a truck to a roommate. Commercial negligent entrustment cases work a bit differently. In addition to proving basic negligent entrustment, the victim/plaintiff must get around the Graves Amendment. This 2002 federal law purports to immunize car and truck rental companies from negligent entrustment liability. The Graves Amendment was part of the ongoing tort reform war. This conflict pits large insurance companies against personal injury attorneys. Insurance companies only care about profits, and personal injury attorneys only care about truck crash victims. Congress added this brief provision to a large transportation bill. Like many policy riders, the Graves Amendment is poorly drafted and has almost no supporting legislative history. These overall flaws make it easier to use the loopholes in the provision and bypass the Graves Amendment. Under subsection (a)(1), negligent entrustment immunity only applies if the vehicle owner or agent “is engaged in the trade or business of renting or leasing motor vehicles.” The statute does not define this key phrase, and as mentioned, lawmakers did not define it during committee meetings or floor debates. So, Cobb County judges must use the phrase’s ordinary commercial meaning. The IRS defines this phrase as “any activity carried on for the production of income from selling goods or performing services.” That definition is so general that it is pretty much useless. Deals in Goods of a Particular Kind: This odd-sounding phrase means that merchants focus on one area. For example, hardware stores are tool merchants, even if they also occasionally sell some candy bars at the register. But most moving truck rental establishments do not deal in trucks. They are moving and storage companies which also occasionally rent a truck or two as well. Has Special Product or Service Knowledge: Most truck rental employees have absolutely no specialized knowledge about moving trucks. They know how to start the truck, but they do not know about hazardous cargo regulations, the air conditioner’s BTU capacity, the engine’s horsepower, or anything else. Since most moving truck rental companies or agencies are not in the trade or business of renting motor vehicles, the Graves Amendment is probably inapplicable in most commercial negligent entrustment cases. At the time lawmakers passed the Graves Amendment, this description probably applied to almost all owners and affiliates. Since there was no effective way to verify a drivers’ license, most vehicle rental companies just required their employees to visually inspect the license. But technology has advanced by leaps and bounds since 2002. Today, it is rather easy to electronically verify drivers’ license validity and also inspect driving records. As a result, such an in-depth verification is arguably the new industry standard. Violating any industry standard is strong evidence of negligence. Many courts have gone a step further. They apply the aforementioned direct/circumstantial evidence analysis to commercial claims. If the customer’s license was invalid, a category which probably includes an expired drivers’ license, negligent entrustment liability may attach as a matter of law. If the customer had a poor driving record, there is a presumption of negligence. Commercial negligent entrustment cases are very complex. For a free consultation with an experienced personal injury attorney in Marietta, contact The Phillips Law Firm, LLC. You have a limited amount of time to act.